This sweet Caramel Candy flavoring sets its pace. It is made from Creamy Caramel which makes up the nice creamy-sweet flavor. Don’t miss this flavor in any way possible. 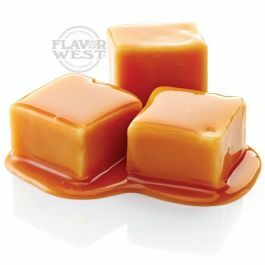 Type: Caramel Candy Soluble Flavoring. Ingredients: Natural and Artificial Flavoring and Propylene Glycol. USP Kosher Grade Flavoring. Usage Rate: 15-20% for E-use. Flavor suitability: Desserts, pastries and baked treats, yogurt, ice cream, candy and more. Specific Gravity: 1.06 No Returns on Flavoring. This Caramel Candy Flavor is AMAZING for E-use. It's very rich & delicious on it's own and very versatile to use in Desserts, Tobacco, and Fruits like Apple or even Pear. I mix this with equal parts of Vanilla Custard or Vanilla Bean Ice Cream and it's totally AWESOME!!! Just love it! Thanks Flavor West! I love the sweet caramel candy flavor. This is a great mixer, never tried it as a stand alone, but it's perfection in a bottle imho. This is really delicious and a little goes a long way. If you are using this for vaping, I suggest 10% flavoring. I used 15% and its almost too much. I am very satisfied with my purchase as well as Flavor West delivery. Everything has been top shelf thus far.